Three points. 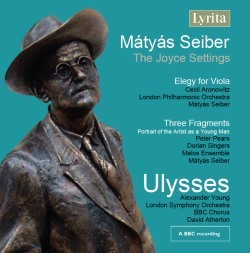 Firstly, for one of the finest of the British émigré composers, Mátyás Seiber is sadly under-represented on CD. At present there seems to be four (five if we include the present disc) recordings entirely devoted to his music. This gives a moderately representative selection of his chamber music (review) including the three String Quartets (review), some songs, a number of a cappella pieces (review) and the Violin Sonata (review). A handful of his orchestral works have been issued including the Notturno for horn and strings (BIS CD-376), the Concertino for clarinet and string orchestra (review) and the Besardo Suite No.2, also for string orchestra (review) as part of compilations. It leaves a large amount of his catalogue missing from the recording studio, including ballets, film music and most of the jazz-inspired music. Secondly, the Mátyás Seiber Trust has produced a fine website that gives a good biography of the composer, a complete list of his music, a discography and much more. I do not need to replicate any of this: however a thumbnail sketch of the composer may be of interest for those who have not come across Seiber before. Thirdly, any reviewer of this current CD is largely absolved from any detailed discussion of the Joyce works by the comprehensive essay on MusicWeb International by Alan Gibbs. This needs to be read by anyone with more than a passing interest in these great works. When Howard Hartog edited his European Music in the Twentieth Century (Penguin Books, 1957) Hugh Wood was able to state that Seiber’s ‘best known works’ were the present cantata Ulysses and the third string quartet Quartetto Lirico (1951). Other ‘notable’ pieces were the Elegy and the ‘powerful’ Concert Piece for violin and piano. If concertgoers were asked about Seiber’s music nowadays, I guess that the questioner would draw a blank. He seems to have largely disappeared from view. One possible exception to this is the ever popular Three Hungarian Folksongs. This is where I was introduced to Seiber’s music: they featured in a concert of the now defunct Stepps and District Choral Society under their musical director, the Rev. Fred. Muir. Shortly after this performance, I discovered the old Decca recording (SXL2232) of the present Elegy and the Three Fragments which had been released in 1960. The two Seiber pieces were coupled with Humphrey Searle’s fine Symphony No.1 played by the London Symphony Orchestra conducted by Sir Adrian Boult. I do not think I was impressed: how times change. Mátyás Seiber was born in Budapest on 4 May 1905. He studied with fellow-Hungarian Zoltan Kodaly at that city’s Academy between 1919 and 1924. His musical achievements included playing in the orchestra of a Trans-Atlantic liner and time in Russia as a musical correspondent. In 1928 he taught at the newly-created jazz class at the Hoch Conservatory in Frankfurt. During this period he played in the Lenzewski Quartet and was musical director in various theatres. In 1935 he immigrated to England where he was engaged in a number of jobs, including working in a publishing house, teaching at Morley College and founding the Dorian Singers. From the end of the Second World War he concentrated on composing, teaching and conducting. Seiber was killed in a motor-car accident near Johannesburg on 25 September 1960. As a composer, Mátyás Seiber engaged with a number of musical styles including jazz, Bartók and twelve-tone techniques. His catalogue of work is wide-ranging and includes an opera, three string quartets, a variety of concerted works and many songs and folk-song arrangements. Hugh Wood, in the liner-notes, explains that James Joyce’s great novel Ulysses made a huge impact on Seiber in the years before he considered using the text for a musical setting. The composer had ‘a deep insight into every level of meaning it (Ulysses) possessed.’ He became aware of the ‘peculiar affinities with music’ that the novel seemed to present. The cantata Ulysses which was composed in 1947 is a considerable and impressive work by any account. It is scored for a large orchestra, tenor solo and chorus. Its duration is more than three-quarters of an hour. In fact, Wood has suggested that it could be well be categorised as a ‘Choral Symphony’ in five movements rather than a cantata. It was premiered at the Central Hall Westminster on 27 May 1949. The sleeve-notes give a detailed exposition of Ulysses musical progress; however it is important to note that the cantata makes use of the ‘Ithaca’ section of Joyce’s book. This is composed of a ‘catechism’ of 309 questions and answers. It was apparently the author’s favourite section of the book. Seiber has chosen metaphysical questions rather that majoring on some of the more pedestrian issues. The tenor solo (Alexander Young) is charged with raising five interrogations which are subsequently responded to by the chorus. These are 1. The Heaventree, 2. Meditations of Evolution increasingly vaster, 3. Obverse meditations of Involution, 4. Nocturne Intermezzo and 5. Epilogue. In a 1970 article in the Musical Times, Hugh Wood wrote, ‘the basic reason for the quality of this score is the successful fusion of disparate elements: the style is impure, that is, it is diverse and enriched from many sources.’ Holst, Bartók and Schoenberg are suggested as possible aesthetic markers. I felt this disparity of styles became largely unnoticed whilst listening to the cantata and it certainly did not trouble me. I think that two things can be adduced here. Firstly, Seiber has a perfect understanding of word-setting which couples text and music together in a satisfying unity. Secondly, he has full control of the formal development of the work – from the opening to the closing low note, the cantata works its magic. The various elements seem perfectly natural in their setting and never give the impression of ‘cut and paste’. The Elegy for viola and small orchestra was composed in 1953 and had been commissioned by the Donaueschingen Festival in Germany. It received its premiere there under the auspices of Hans Rosbaud conducting the Southwest German Radio Orchestra. The viola soloist was Ulrich Koch. This is a striking, but often introverted, work that explores a range of moods in its short compass. Hugh Wood mentions some of the Elegy’s diversity including fanfares of muted trumpets, rich string chords and a largely rhapsodic feel to much of its progress. The scoring and the structure are much simpler than the two cantatas, yet the composer has imbued it with depth and considerable imagination. It is not a serial work, but inhabits a world of typically gentle dissonance. The Gramophone review of the 1960 LP noted that the solo viola sounded a little distant, and suggested it may be that the soloist Cecil Aronowitz may not have had the ‘knack of seizing the limelight’. Any problems of balance appear to have been sorted out on this re-release. Aronowitz gives a fine and thoughtful presentation. Unfortunately, there is no other recording to compare it with. The London Philharmonic Orchestra is conducted by the composer. I was bowled over (42 years late) by the Three Fragments from A Portrait of the Artist as a Young Man. The work was a commission from the Swiss section of the International Society of Contemporary Music and was subsequently premiered in Basel during November 1958. Seiber has used a wordless chorus with the text presented by a speaker rather than a singer: Peter Pears gives a stunning and often moving performance here. There is an element of ‘sprechgesang’ with the ‘relative pitches’ of the words notated in the score. The accompaniment is by small ensemble including flute, clarinet, bass clarinet, violin, viola, cello, piano and percussion. Although this is a 12-tone piece, I believe that Seiber’s serialism lies lightly on the work’s soundscape and development. There is some pointillism associated with Webern, but nothing that detracts from the Three Fragments’ approachability. It is true that Seiber’s ultimately romantic style and his strong sense of lyricism make his serialism a pleasure to hear. This CD is a masterpiece from the first bar to the last. Three of Mátyás Seiber’s finest works are presented here. Although the recording of the Elegy and the Three Fragments was made in 1960 and Ulysses derives from a 1972 BBC broadcast, the passing of the years has not flawed the recordings. The notes by Hugh Wood, Alan Gibbs and Paul Conway are superb in their detail. The texts of Ulysses and the Three Fragments are included. These three works are important for the understanding of one particular trajectory of serialism and post-war music. It is unbelievable that it has taken until 2015 for Ulysses to be made generally available on record or CD. The other two works have been deleted for a generation although this recording of the Three Fragments was issued some years ago with works by other composers on Australian Decca Eloquence 480 2152. It seems to me that they should be taken up as repertoire pieces as soon as possible. For one thing, there is always a dearth of concerted works for viola. Finally, it would be ideal if record companies and concert promoters could feature more music from Mátyás Seiber’s catalogue. Do we really need yet another recording of The Lark Ascending or Elgar’s Cello Concerto? Mátyás Seiber has only been played at the Promenade Concerts twice: Tre Pezzi (1959) and Notturno (1955). Based on the magnificent quality of the works on this present CD this is a musical scandal.